Side view of NOAA Ship Ronald H. Brown underway. Image courtesy of Wade Blake/NOAA. Download larger version (jpg, 2.3 MB). Measuring 274 feet in length and displacing more than 3,200 tons, NOAA Ship Ronald H. Brown is the largest ship in the NOAA fleet. 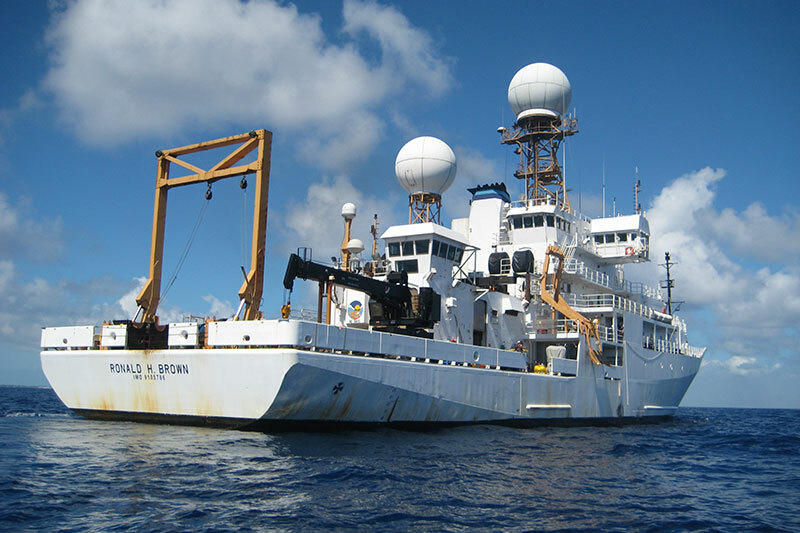 Since being commissioned in July 1997, this state-of-the-art oceanographic and atmospheric research vessel has traveled from its home port in Charleston, South Carolina, to the Atlantic, Pacific, and Indian Oceans. The Brown is equipped with a suite of instruments for collecting and assessing scientific data above and below the ocean surface, allowing us to simultaneously measure the atmosphere and the ocean and increase our understanding of global climatic changes and other environmental issues. These instruments include a system to measure carbon dioxide levels in the air and surface waters; Doppler radar; echosounders and a multibeam sonar system to collect information about both the water column and the seafloor; and several tools to gather oceanographic data such as current speed and direction, temperature, salinity, fluorescence, and conductivity. Using a series of cranes and winches, the Brown is also capable of supporting the use of heavy scientific equipment such as submersibles and surface floats. This capability is further enhanced by the ship’s dynamic positioning system, which allows the Brown to hold its position in the water and allow for the successful deployment and recovery of sensors necessary for scientific research. 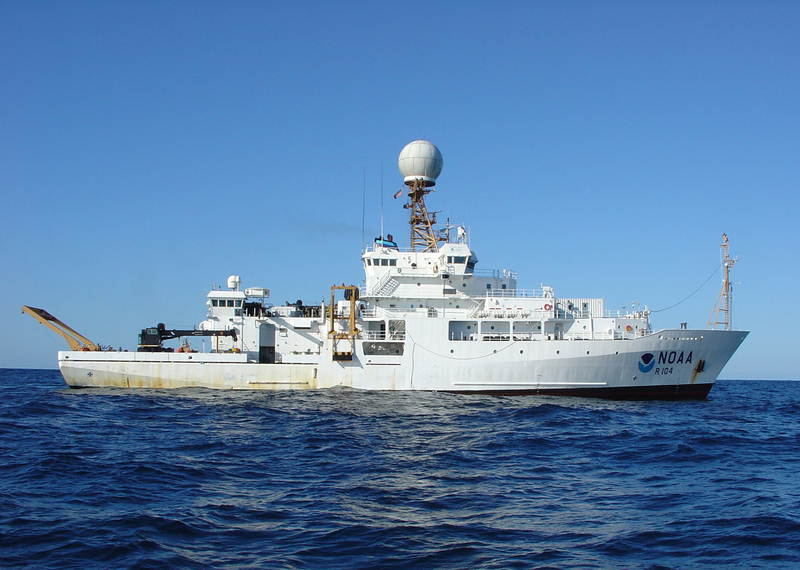 Ronald H. Brown is operated by NOAA’s Office of Marine and Aviation Operations. The ship is named to honor the late Ronald H. Brown, the first African American to serve as Secretary of Commerce. Brown made it his mission to generate jobs and provide opportunities for ordinary Americans, and he was an ardent supporter of the NOAA fleet. He was killed in a plane crash on April 3, 1996, while on a trade mission to Bosnia. 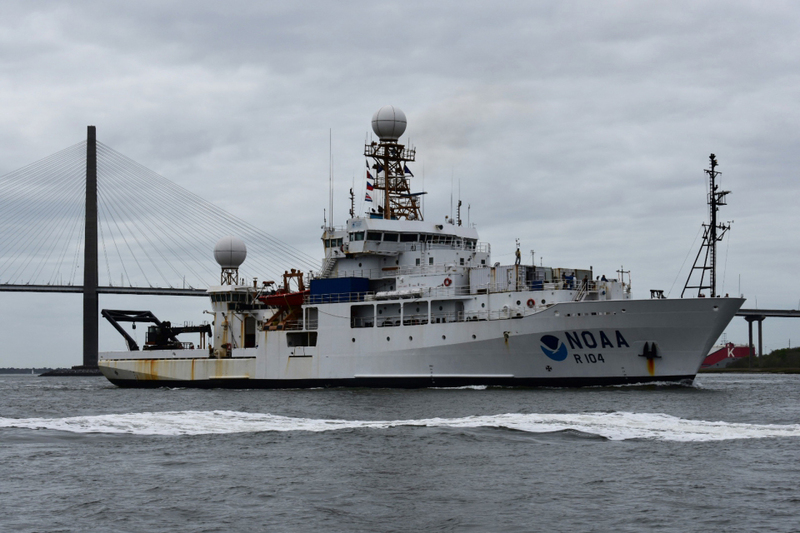 NOAA Ship Ronald H. Brown sailing into Charleston, South Carolina, on March 25, 2017, after a 1,347-day deployment – the longest of any NOAA ship ever. 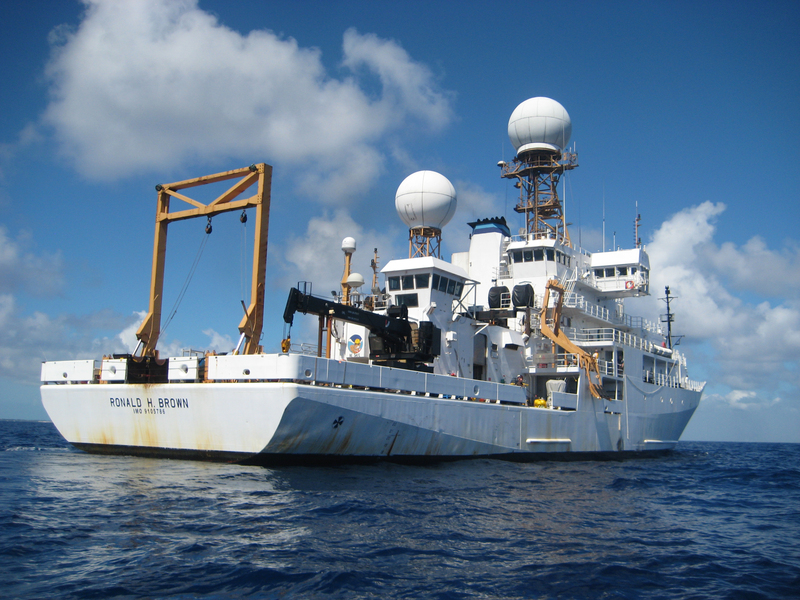 During its multiyear voyage, the ship traveled nearly 130,000 miles as it conducted scientific research and serviced buoys that collect a wide variety of environmental data. Image courtesy of AB Tracy Sorgenfrei / NOAA. Download larger version (jpg, 396 KB). Photo of the Brown off the starboard stern taken from the ship’s workboat. Image courtesy of Wes Struble/NOAA. Download larger version (jpg, 3.7 MB).